1. The Sea of Tranquility by Katja Millay: One of my favorites!!! But I find that I don't talk about it enough and I don't even know why!! I think sometimes it's just SO special to me and it was a hard one to talk about how great it was...that I just don't. 2. 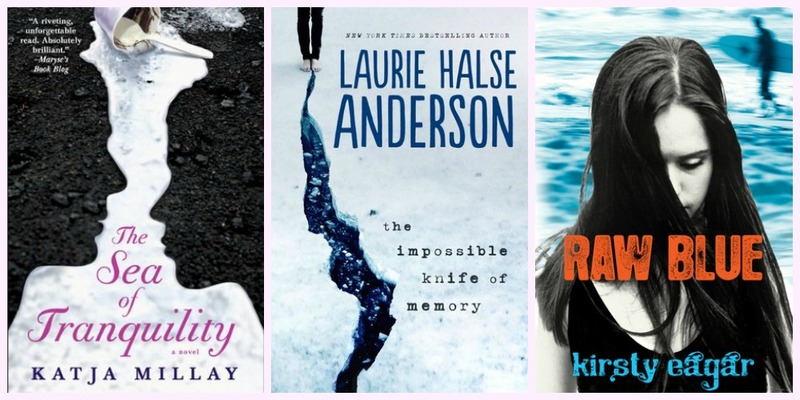 The Impossible Knife of Memory by Laurie Halse Anderson: I LOVED this book (even gave it 5 stars) and it was one of the first books I read in 2014 and then I went on to have a great reading year with lots of 5 stars and new faves. I think it got lost when I talked about all my faves because I read it so early in the year that it wasn't as fresh and also I had books that impacted me a lot. But omg I will take this time to say READ ITTTT! 3. Raw Blue by Kirsty Eager: I LOOOOVED this book and shouted all about it when I read it back in 2011. But it's been a while!!! Also, I think I didn't talk about this one as much after because it wasn't available in the US (at least at the time). It's worth ordering from Australia! 4. My Sunshine Away by M.O. Walsh: This was a wonderful coming of age story that I just couldn't put down. I devoured it in about a day and a half. I refused to go to work or eat until I had finished. It was that good. Yet, I feel like it never really got all of the love it deserved from me or from the critics. Please read! 5. Under the Tuscan Sun by Frances Mayes: I read this a while back and I absolutely loved it. I loved the discussion about remodeling and all of the work that went into that home. I loved the discussion about food. I loved the discussion about learning and becoming a part of a new culture. I definitely need to re-read soon. 8. The Time Traveler's Wife by Audrey Niffennegger: This is one of the few books that I have loved and read again and still loved. It brings me to tears each time I read it. It just is so good to me, way better than the movie. I haven't read it in at least 5 years. I think it is time for me to break this puppy out again! 9. 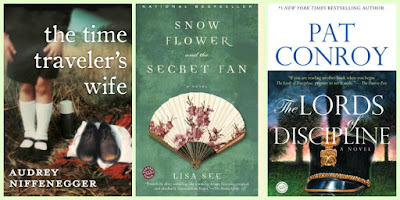 Snow Flower and the Secret Fan by Lisa See (review): This is another book that I ripped through and just fell in love with. I studied abroad in China so I feel sort of connected to their culture in a way, but this book really transported me back in time to a time where women only really had each other to rely on and were not in control of their own destinies. But despite that distance of time and culture, you can relate to Snow Flower and Lily in so many ways. 10. The Lords of Discipline by Pat Conroy: I just had to include this one. I was introduced to this book in high school in my Classic and Modern Novels class (best high school class ever. Literally we sat in our seats and read the entire period). This was a wonderful coming of age story and a story about some great friendships. The characters really jumped off the page at me and I was so invested in their lives. This is the only Conroy book that I have read, and I have been meaning to revisit it as well as his other novels. I was so sad to learn that he had passed. His work will always hold a special place in my heart. What books have you not talked about in a while or enough but SUPER love? Tell us!! LOVE The Sea of Tranquility, The Time Traveler's Wife, and Snow Flower and the Secret Fan. Great picks! I didn't even think of adding The Time Traveler's Wife, it's one of my favorite books. Great post. Lori and I both picked John Steinbeck's novel East of Eden!! This book is an amazing read!! I've just bought the hardbacks for Speak and Wintergirls (because they're shiny and beautiful and I needed them) but I haven't read The Impossible Knife Of Memory yet. I must change this! Ooh nice! Those are pretty much all new to me books! I really need to read the Impossible Knife of Memory! I'm so glad to see My Sunshine Away (one of my favorite books of last year) and The Lords of Discipline (one of my favorite Conroy novels, and Conroy was one of my favorite authors). Try The Prince of Tides if you want some more Conroy! I almost put The Sea of Tranquility on mine also! I don't read much YA but this one really stayed with me. Under the Tuscan Sun and The Time Travelers Wife are good reads that I read so long ago they might deserve a re-read. And my daughter read Speak by Laurie Halse Anderson in middle grade and loved it, so she gave it to me to read and I enjoyed it also. Great choices, all! I've heard a lot of good things about Sea of Tranquility. I need to read that soon! Aww. Your list reminded me that I still need to read Under the Tuscan Sun. haha The movie is really great but my Mom says the book is better. Julia, I also loved The Time Traveler's Wife by Audrey Niffennegger. It has been years since I read it! I really must get my own copy to re-read; see if I love it second time around too. Under The Tuscan Sun! I haven't read it but I really adore the movie and now I'm thinking I should pick it up. The Time Traveler's Wife is one of those books I would love to reread but I'm not sure if I could! It's so heartbreaking and tragic and beautiful, I really loved it. I can still remember where I sat when I read and finished it almost 9 years ago. Sigh. Under the Tuscan Sun and The Time Traveler's Wife are both great books. I prefer the film version of UtTS to that of TTTW, though. I forgot about The Time Traveler's Wife when I was making my list. That's a good one! 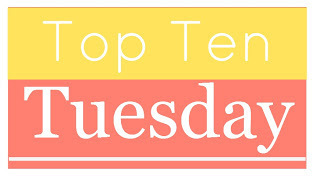 It's interesting, bc I'm seeing SO MANY books I've not heard about with this week's TTT! Time Traveller's Wife I'm all about, but the rest I'll have to look up!! Thanks BnB kids! I loved THE IMPOSSIBLE KNIFE OF MEMORY and THE TIME TRAVELER'S WIFE! I STILL haven't read THE SEA OF TRANQUILITY but I've been meaning to so I requested it from the library. I haven't read any of these! How terrible of me. I did just finish John Steinbeck's Of Mice and Men for school though and enjoyed it. I'll have to try something else of his this year.